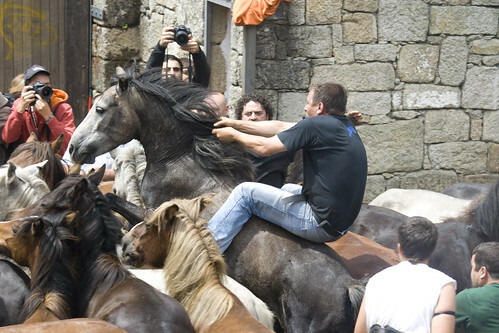 In a country where bullfighting is still commonplace, I really didn't know what to expect when I received a text from a friend saying: "Tomorrow is 'rapa das bestas' in Sabucedo - very spectacular fights between humans and horses"! Indeed it turned out that the Rapa das Bestas was probably the last thing I would have thought of and it turned out to be a fascinating day. 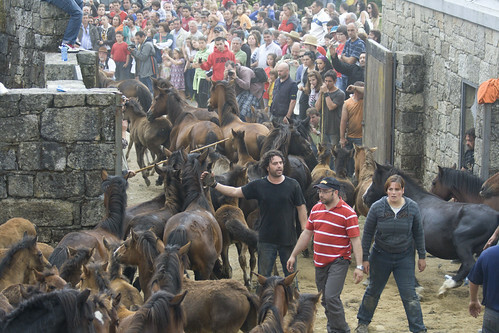 In Sabucedo, the horses, though owned by the villagers, are free to live in the woods on the hill during the year. However, with my limited equine knowledge, I wasn't aware of the hairdressing needs of such beasts. 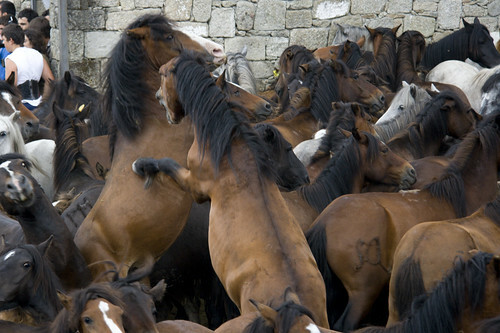 Every year the villagers round up the horses, drive them into a corral, and cut their hair. Surprisingly, semi-wild horses don't stand still when you come at them with a pair of shears, and so the event is an incredible competition of horse versus hairdresser. Luckily, it turns out that the hairdressers in Sabucedo are about the manliest bunch of men and women I've ever seen, and getting into a ring with 200 horses, kicking and brawling, and running after them until you have them under control enough to wield a pair of horsehair clippers is all in a day's work. The event actually goes on for four days and draws such a crowd that there is a whole festival built around it, with camping over the weekend, music, and pulperias selling fantastic octopus all over the place. We only went for the haircutting though, missing out the massive hangover that I presume 90% of the people there seemed to be suffering from (the other 10 percent still being heavily under the influence). 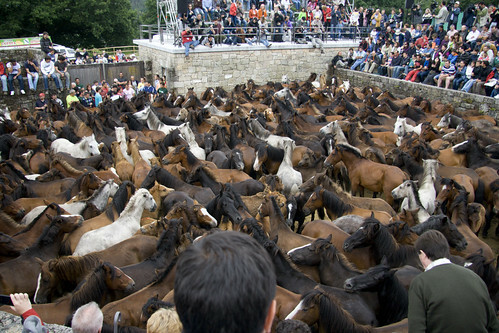 We got into the seating around the corral a little before midday, and soon enough the 200 animals where herded into the arena. 200 animals in a space that size was presumably quite a culture shock for animals which are used to roaming freely and so there was a lot of angry neighing, biting of neighbours, kicking and the occasional reared brawl. This was about the most inhumane part of the ordeal, but it seemed that apart from the odd nibble, none of them was really hurt, save for the feelings of a few alpha males. First was the children's turn and the kids, I guess as young as 10 or so, ran around, getting hold of the fowls, as the adults tried to keep the larger horses at bay. The fowls, though small, are extremely tough and gave the kids a run for their money, but it seems that with one on the ears, and one on the tail, they could usually keep them under control enough to steer them out of the corral and to their own, personal salon. 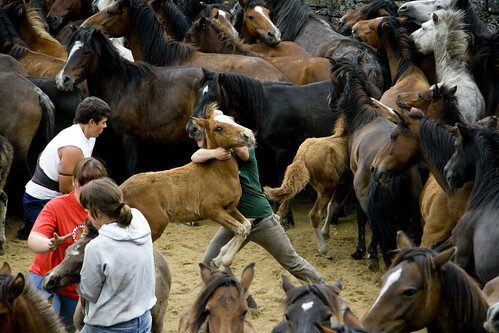 Once the foals had all been safely taken out, the main event began. Three main groups of men and women would walk around the arena, sizing the horses up, and on choosing one to go for, one member of the team would take a run up and jump on the horse, holding onto the mane. Unsurprisingly the horses would not have any of this and would attempt to race through the crowd, with the rider on its back. By this time there was usually another man holding on at the back to the tail, trying to keep the horse from throwing the rider off. 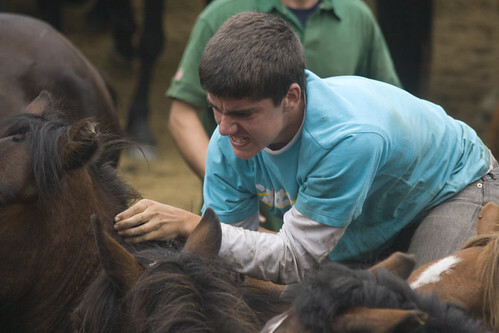 After some powerful coercion, and attempting to get the horse into a free space, the rider would leap off again, holding onto the head off the horse, with one arm over one eye, and gripping at the bottom of the jaw, while another man would be the other side, with his arm over the other eye, grabbing the other side of the jaw. 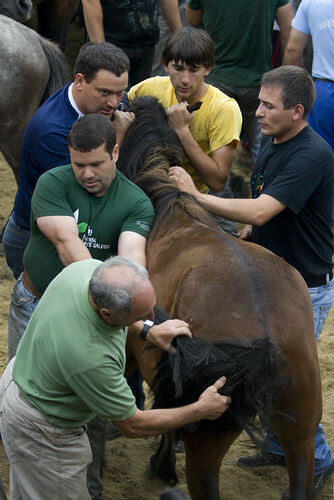 This generally seemed to calm the horses down enough that with three people holding on, they would stand still and the hair cutting would commence, with a couple of men with big pairs of scissors snipping away at the tail hair, the mane and the fringe, getting the style more in line with this years equine fashion. 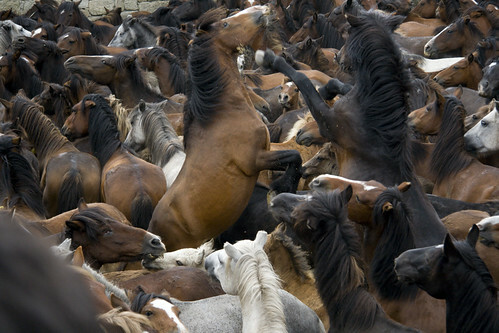 Quite frequently the horses really didn't want any of this game and the teams would have to wrestle the horses to the ground in order to calm them down, three or four men lying on the horse to keep it from jumping up and trampling those around. Amazingly, with 200 horses, nobody was seriously hurt and only one man got the tail end of a kick, limping off briefly but coming back a few minutes later. 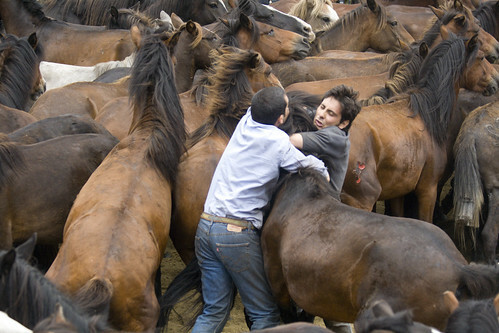 Although the horses would occasionally kick each other it seemed that the shouting from the men and women really was enough to get them out of the way when they needed it, and stop them from kicking the people in the ring. It was truly a remarkable sight. 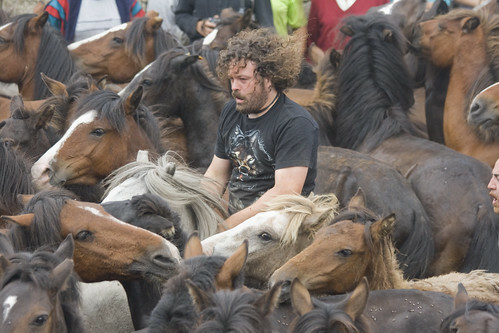 After a couple of hours and perhaps half the horses shawn, the groups called it a day and the horses were led back out of the corral. It was truly a spectacular event, and if you want man versus animal without the bloodshed of a bullfight, I would highly recommend checking this out. This looks incredibly cruel to me. 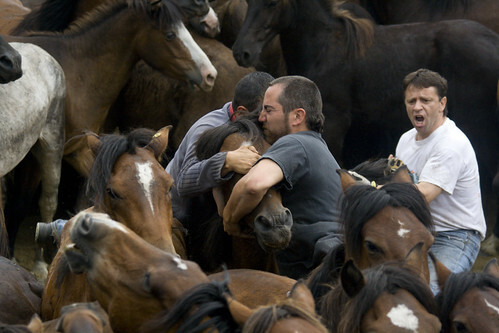 The horses are terrified because horses consider man a predator just like a mountain lion that leaps on their backs and tears them apart. 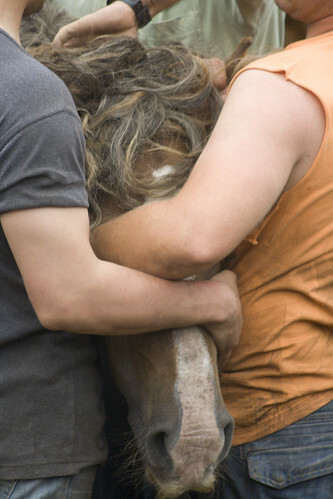 Here are some photos they don't show you: crushed foals, and carcasses of horses who died of heart failure and broken limbs.